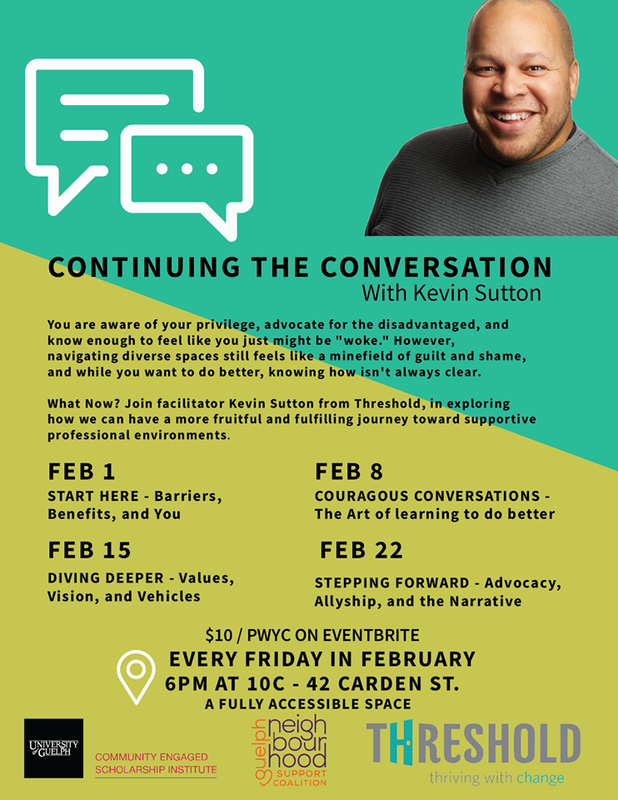 We are excited to announce, with support from CESI, a February Friday series called Continuing The Conversation with Kevin Sutton from Threshold. Kevin was a big part of our Equity Conference last year and these 4 nights are a way of continuing conversations that were started there. CONTINUING THE CONVERSATION is a conversation series on equity, diversity, and inclusion. You are aware of your privilege, advocate for the disadvantaged, and knowenough to feel like you just might be “woke.” However, navigating diverse spaces still feels like a minefield of guilt and shame, and while you want to do better, knowing how isn’t always clear. What Now? Join facilitator Kevin Sutton from Threshold, in exploring how we can have a more fruitful and fulfilling journey toward supportive professional environments. Friday, Feb 1st @ 6:00 pm – Start Here: Barriers, Benefits, and You. Pay online or at the door. KEVIN SUTTON is a writer, workshop facilitator and owner of Threshold. His work with business, organizations and government agencies has led him to equity and diversity work helping organizations nurture supportive professional environments where everyone is treated with dignity and respect.